Save 80% of productive time. 99.6% accurate reconciliation of Payments, Returns, Commissions and Inventory in realtime, with no cumbersome excel uploads/ downloads. From procurement, to warehousing. From order processing to shipping to returns, entire order lifecycle management is just clicks away. No more manual entries and delays in filing GST returns. 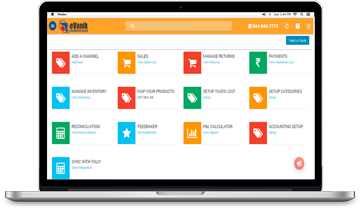 Single Click GST compliant integration with our favorite accounting software. Manage common inventory for multiple channels and automatically reprice to stay on “Buy Button” always. Keep growing your sales. For brands selling through partners, dealers etc., get real time visibility and alerts on live / Out of Stock products and price change alerts with email notifications. What to sell? Where to sell? How much to stock? What price to buy? What others are selling? All in one AI dashboards for you. We understand how difficult it gets to exchange data and information from various places. We’ve connected almost everything that you need for your online business. Amazon, Flipkart, Shopclues and all major e-commerce marketplace channels in India are integrated. Click, Add and Watch how your data comes to your OWS in seconds. We are now connecting with global e-commerce marketplace channels. Be it Tally ERP9 or Zoho Books or Alignbooks, your favorite accounting software is integrated with just a single click. We’ve made it so simple. No need to manually enter your sales, returns, payments and other vouchers. Just connect once and see you compliant your accounting and taxation becomes. 3 rd Party Logistics providers and aggregators, Payment Gateways, Shopping Carts and more. There’s always some new integration brewing at eVanik’s development center. Our team keeps thinking of what you will ever need to grow your online business. We’ve always believed in an end-to-end solution and that is the best way to grow your online business. eVanik is more than a software – from free training and onboarding to dedicated support and customization, we invest in your success. eVanik was built by solving problems of our customers. And we still believe in the same. Our innovation center delivers world-class solutions with regular updates. We deliver the simplicity and keenness of experiencing your business with no hidden costs. Understand the price you subscribe upfront, with no surprises. Awarded as best SPN by Amazon India and amongst the Top 50 Startups in India by Economic Times, Department of Science and Technology, Facebook and IIM-Ahmedabad. disrupted the world of e-commerce financial and inventory management.